Mexico City is a dynamic and vibrant destination, with centuries old historic landmarks, rich cultural heritage, modern art, architecture and cutting-edge fashion scene. There’s no denying Mexico City should be your next trip. The city is an international culinary hot spot. In addition to classic and modern dishes, chefs like Enrique Olvera owner of the restaurant Pujol and Elena Reygadas owner of the restaurant Rosetta are combining their inspiration from countries around the world, such as France, Italy, Spain, Israel, Japan and Thailand, with indigenous ingredients to create original dishes at the city’s new dining establishments. There’s even an emerging Mexican wine scene, in addition to local spirits and artisanal mezcales.. From historic districts to colorful markets and trendy neighborhoods you’ll always find some delicious food to taste. Foodies welcome! Begin your visit with a tour of the central plaza: Plaza de la Constitución, better known as El Zócalo. At the heart of the Historic Center of Mexico City, this expansive plaza was at one time the ceremonial site for the Aztecs. Today, it’s where the City celebrates big events such as Independence Day on September 16th. Just next to the plaza, you’ll find the impressive Aztec ruins of Templo Mayor. The grand temple build in 1325 was one of the principal temples in the capital city once known as Tenochtitlán. 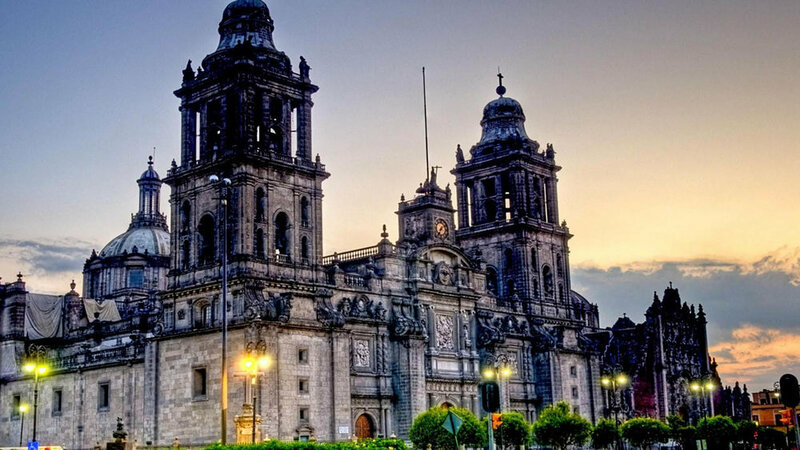 Mexico City went through several significant changes over a period of nearly 200 years until de Spanish tore dow the pyramids and the temple in 1521 to use many of the stones to construct the Metropolitan Cathedral of the Assumption, the largest catedral in Latin America. Art enthusiasts, especially those interested in the city’s famous muralists, will want to visit Mexico City’s innumerable museums. The Antiguo Colegio San Ildefonso was built as a Jesuit seminary in the mid-16th century and is known as the birthplace of the muralist movement and also is home to the first mural by Diego Rivera called “La Creación” (The Creation) along with murals by several other well-know artist such as José Clemente Orozco. Other must see museums include Modern Art Museum whiich maintains one of the most extensive collections of Mexican art. Fans of the famous Mexican painter Frida Kahlo should go to the Museo Frida Kahlo, the blue colored home of the renowned artist’s family and where she lived with Diego Rivera. We also can’t miss an opportunity to talk abour our beautiful neighborhood: La Roma, where La Palomilla Bed and Breakfast is located. Along with the adjacent neighborhood of Condesa, its recognized as one of the City’s major cultural and culinary hubs. The once wealthy area known a century ago for its stylish mansions in now a hip neighborhood with art nouveau style buildings and tree lined boulevards boasting restaurants, bars and galleries. Begin the morning with a tour and shopping for ingredients at the colorful stalls of Mercado de Medellin in Roma Sur, where the food lover can delight in freshly dried vegetals and fruits. Then enjoy lunch at some pretty place, ask our staff for suggestions! the offer is extensive you can choose from elegant restaurants, to coffee shops, to fondas (small establishments with delicious food). After that you can enjoy a nice walk around the place and maybe visit some museums or galeries, such as Museo del Objeto del Objeto (MODO) which is located in Roma Norte. And we are not the only ones who say that a trip to Mexico City can change your life. Here are a few testimonies of people around the globe sharing their experience in this amazing city.